His prediction was soon surpassed shortly after Gina became a full-time member of the Anselmian community, as she stood on stage in the NHIOP’s main auditorium on March 24th, 2019, to affirm the oath of her office as President of the Class of 2022. She, along with six of her classmates, was formally inducted into their respective student government officers in a ceremony hosted by members of the Student Government Association (or SGA). This ceremony, in which all new/re-elected members of SGA were sworn in and graduating SGA members were given a hearty farewell, was well-attended not only by students but by the family members of those students getting sworn in as well. The inauguration ceremony formally commenced at around 2pm, beginning with a brief introduction of the event by Chief of Staff Kerrin Norton, ‘19, after which Father Augustine gave an opening prayer. Dean of Students Alicia Finn, the advisor to SGA, was next to take the podium, beginning her remarks with a reference to the film “Bee Season,” in which a young family member (named Eliza) is found to have a gift for spelling words. Dean Finn asked the audience to prepare to visualize, just like Eliza in “Bee Season,” the following word: Leader. For each letter, Dean Finn assigned a key “virtue” of leadership to demonstrate how said virtues were innately needed for good leaders. The letter “L” for example stood for “legitimate power,” something that all holders of SGA offices needed to use as a way of furthering the common good of the Saint Anselm community (and never as a tool of “manipulation”), while the following “E” represents the word “energy,” something that the Dean stressed was paramount for the holder of any leadership position to have. Dean Finn also remarked that, as atoms generate more energy through joining together (or undergoing fusion) than by being split apart (or undergoing fission), so the best leaders use their energy to get people to collaborate rather than split up against each other. “A” represents the word “advocate,” something SGA office holders needed to be in order to “empower the underrepresented,” while “D” stands for “due diligence,” making certain that leaders were responsible in their actions. The final “E” stands for “educator”, a role any leader in SGA will take if they aim to bring about new changes in the college community, and the “R” stands for “resilience,” a character trait Dr. Finn said was necessary to develop a “thick skin” to withstand the sometimes tough criticism that leaders must face. Dean Finn closed her speech on leadership with an old Irish wish, that the spirits of the members of SGA “cradle a multitude of stars that carry you through every possibility, hope, and dream”. Following the Dean’s remarks, multiple awards were presented by SGA to reward those members of the faculty, staff, and student body that had gone “above and beyond” the call to serve the Saint Anselm community. The recipient of the Abbot Gerald McCarthy Award for faculty was Professor Carrie Macleod, while the beneficiary of the Dr. Constance Richards Award for staff was Lee Joyce, while the receiver of the Dr. Alicia Finn Award for administrators was Associate Dean of Students Andrew Litz. Two other awards of note include the Father Peter Guerin Award to recognize the club of the year (which went to the Dance Club) and the Dr. Joseph Horton Award for the SGA member of the year went to Kerrin Norton, ‘19. 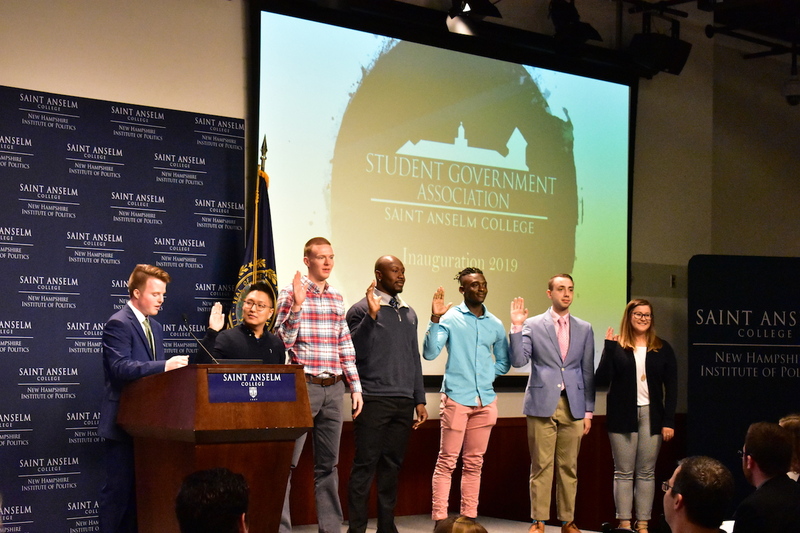 Upon conclusion of the awards ceremony, the swearing in ceremony for the acting SGA President (Joshua Hughes, ‘20) and Vice President (Jacob Ethier, ‘20) took place. In his inaugural speech, Vice President Ethier highlighted the close bonds he had formed in his life with both his family and his friends at Saint Anselm College. Vice President Ethier then elaborated on SGA’s greatest accomplishments of the year, which included the securing of funding for a campus communal garden, and highlighted the goals SGA wished to reach in the coming years, such as making Saint A’s a greener campus. President Hughes also made note of SGA accomplishments over the past two years, from helping to plan the Club Space inside the Student Center to passing a resolution calling for the erecting of handrails on the paths from Courts to Lowers. President Hughes also thanked his family (especially his nana, known for her “world famous cookies”) and his friends, stating that “everything” he had was because of their unwavering support, before thanking Vice President Ethier for his incredibly hard work ethic. Both the President and Vice President of SGA also profusely thanked both Chief of Staff Kerrin Norton and Dean of Students Alicia Finn for their guidance and tremendous amounts of help. Vice President Ethier then closed the ceremony by swearing in the new officials from each class represented in SGA. The new members of SGA look forward to being advocates for the student body, and if they’re as energetic about their new roles as Class of ‘22’s President Gina Gagliardi, then the Anselmian community is more than prepared to face the challenges ahead.